Astrophysicists from the Universities of Oxford and Rome have for the first time found evidence of ripples in the Universe’s primordial sea of neutrinos, confirming the predictions of both Big Bang theory and the Standard Model of particle physics. 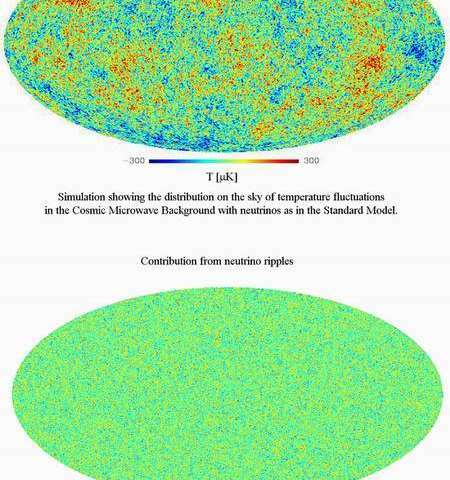 Although it is impossible to measure this ‘Cosmic Neutrino Background’ directly with present-day technology, physicists predict that ripples or waves in it have an impact on the growth of structures in the Universe. In research to be published in the journal Physical Review Letters, Dr. Roberto Trotta, Lockyer Fellow of the Royal Astronomical Society at Oxford’s Department of Physics, and Dr. Alessandro Melchiorri of La Sapienza University in Rome were able to demonstrate for the first time the existence of ripples of primordial origin in the Cosmic Neutrino Background. The paper “Indication for Primordial Anisotropies in the Neutrino Background from WMAP and SDSS” by Roberto Trotta and Alessandro Melchiorri has been accepted for publication in Physical Review Letters.